Parents can relax and recoup while their children enjoy resort activities. 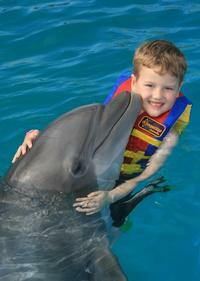 Playa Grande has a daily Kids Club for children ages 5 -12 that offers activities daily from 10:00am - 4:30pm. Activities include pool games, beach volleyball, dance lessons, cooking demonstrations, Spanish lessons, basketball and more. Lunch is included everyday and the cost of the program is $20 per day or $50 for the entire week per child. The Ridge Luxury Villas invites kids to enjoy one of Los Cabos’ well-known activities by taking a swing on the resort’s mini golf course. The resort’s pool area, separate from the two adults only pools on property, includes a special treat for kids with a twisty water slide. Playa Grande Resort is currently offering the “Five-Night Family Package” with components suited for the entire family. The package includes accommodations for five nights in a one bedroom luxury suite, daily breakfast buffet, $50 certificate for dinner at one of the on-site restaurants, daily access to the kids club, a Couples Baja Getaway treatment package at the spa that includes a neck, shoulder and back massage and a family four pack of sunset cruise tour tickets on the Buccaneer Queen. This package is $1,299 USD with taxes included and is based on two adults and two children under the age of 12.